5 no scan Hungary unknown PAL 1993 issue by Gordiusz. 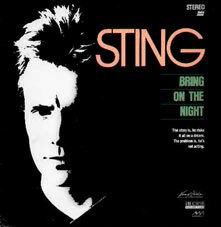 Bring on the night is a movie/documentary released by Micheal Apted about Sting and "the blue turtles band" during the rehearsals of the first shows of "The dream of the blue turtles" tour, in Paris. The film feature rehearsals in a castle, interviews of all the band, and live in Mogador.